This should have a washable cover. If you are getting a used car seat they are only good for 6 years (unless otherwise marked). The seat should have a sticker with the manufactured date on it, if it does not don’t get it. Some people say not to buy a used car seat, you don’t know if it may have been in an accident and been compromised. You will want a convertible car seat later (one that goes all the way to a booster seat). For now you need an infant car seat. It is easy to remove these from the car and carry the baby around in the seat. This way you can hook the seat into the cart at stores, and have somewhere to put the baby when you go places. The car seat carrier should not be a place for your baby to spend a lot of time, any more than the swing or bouncer, but when you’re in a public restroom you need somewhere safe and clean to put the baby. There are all kinds of fancy accessories for the car seat, but all you really need is a pool noodle or rolled towel to make sure it’s level, and receiving blankets to position and shade the baby. Extra tip: Pay attention when you take the car seat cover off, maybe even take photos. Some of those things are impossible to get back on, especially if you bought it used and can’t find the manual online. 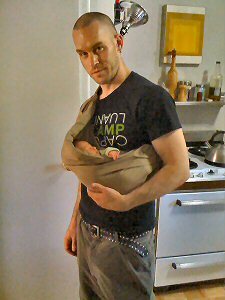 There are a million different kinds of carriers for the baby. You will have to look around and try them to see what you like. A good used baby stuff store is a great place to try on different styles. For a start you just need a sling or wrap type. You want one that puts the fabric on the meaty part of your shoulder, not where a backpack strap would go, closer to your neck. This is the key to not having a carrier hurt. 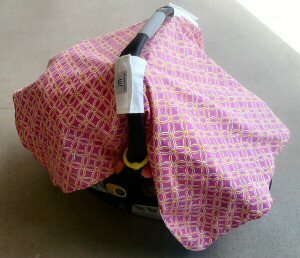 The very basic fabric sling will fold up and fit in your mom purse so you always have it on hand. It is super easy to make this kind of carrier, and cheap. I do not like the ring ones, but I’m paranoid, I know they should be perfectly safe. What’s your favorite tip for hauling around your wee bairn?